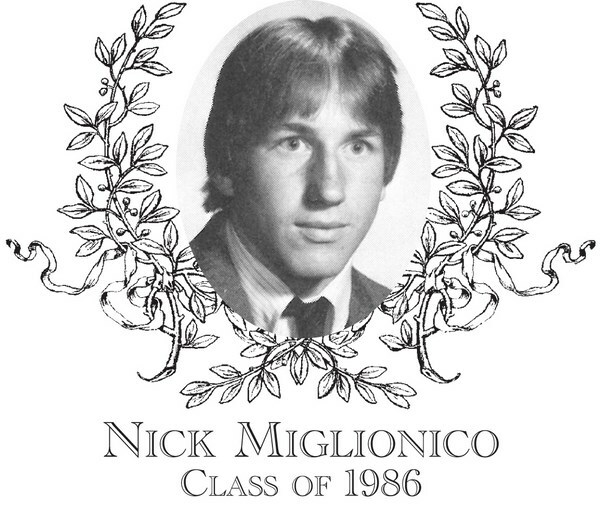 Nick Miglionico, Class of 1986, was an outstanding two-sport athlete at Bartlett High School. Nick made his mark in the fall on the football team and in the spring when he excelled in the sport of baseball. Nick was on the baseball team for three years. According to his coach Bob Pepka, �Nick was a big home run hitter�. In his senior year, Nick batted an outstanding .395 and knocked in 31 runs. It was, however, on the football field that Nick really made his mark. He was on the varsity team for 3 years and was co-captain in his senior year.According to the Webster Times, �Nick Miglionico was a multiple threat�. His coach, Rene Langevin said �Miglionico is a super back and we try to feature him as much as we can�. As the defensive coordinator for the Indians, John Mrazik, remarked about Nick, �that he was the hardest hitting safety he had ever coached. He had great anticipation and range�. Nick was involved in Bartlett�s version of the �Immaculate Reception�. The ball bounced off of a Bartlett receiver, then off of the defense and then into Nick�s hands -- where he promptly ran it in for a touchdown. In his senior year, Nick scored 10 touchdowns. He was awarded the football MVP upon season�s end. Nick, who scored a touchdown and played an outstanding game at safety on defense, was the recipient of the first Harry J. McMahon Defensive MVP Award at the 1985 Thanksgiving Day game versus Southbridge. That year, Nick was also selected to the Border Conference All-Star team as well as theWorcester Telegram and Gazette All-Star team. Nick was selected to represent Central Massachusetts in the 8th Annual Shriners All-Star game where he played safety. He is one of only seven players in the history of Bartlett High School football to ever have been selected for Shriners recognition. Upon graduation from BHS, he went on to Westfield State University where he played football and was selected as a New England Football Conference First Team All-Star as a wide receiver during his first year. Nick also joins his brother Jason as a member of the BHS Athletic Hall of Fame. Nick lives in Dudley with his wife Becky and 2 daughters, Jaime and Jordan. He is a Lieutenant on the Douglas, Massachusetts police force. © 2013- BHS Athletic Hall of Fame. All Rights Reserved.